Follow us on social media and come back and visit for more tips on your spine health! WASHINGTON, D.C. — Chiropractic care has a positive reputation among many U.S. adults for effective treatment of neck and back pain, with about six in 10 adults either strongly agreeing (23%) or agreeing somewhat (38%) that chiropractors are effective at treating these types of pain. These findings come from the first-ever nationally representative annual survey of U.S. adults measuring perceptions of and experiences with chiropractic care. Chiropractic care focuses on neurological and musculoskeletal health, and aims to favorably affect overall health and well-being, relieve pain and infirmity, enhance performance, and improve quality of life without drugs or surgery. Palmer College of Chiropractic, the founding and largest college of chiropractic in the world, commissioned Gallup to design and conduct this study of 5,442 adults, aged 18 and older, in the U.S.
Before you read any further, try this exercise: Take a deep inhale and slowly exhale. As you exhale, release your shoulders and allow them to drop down into a fully rested position. Did you notice a full inch or more of movement? 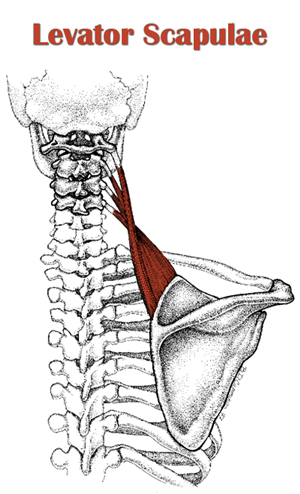 These are your levator scapulae muscles, and they are rarely relaxed. They are responsible for elevating the shoulders, rotating the head, and keeping the head from falling forward. Between typing, driving, looking down to text, and holding the phone between the ear and shoulder; the levators are constantly working. Not only are they overworked, they are often the culprit of neck pain, shoulder pain, and the dreaded ‘stiff neck’. Overuse of these muscles can lead to chronic tension and painful trigger points. Read on for some common bad habits that lead to levator scapulae pain and how to correct them! Solution: Keyboard and work surface should be level with the elbows in their relaxed state, with the arms at a 90 degree angle, allowing the levators to relax. Consider using a chair with arm supports or keyboard tray to get the perfect angle. Solution: If talking on the phone is part of your job, consider an ear piece or head set, which will prevent excessive one-sided use of the levator. Solution: Bring awareness to your posture several times a day by checking in with your head and shoulder position relative to the rest of your body. Roll shoulders back and down into a natural, resting position. Allow the head to float up and back to sit on top of the body, avoiding the “forward head” posture that excessively lengthens and strains the levators. If you are dealing with neck and shoulder pain, chiropractic and massage therapy can not only alleviate symptoms, but help address and correct any dysfunction within the structures. 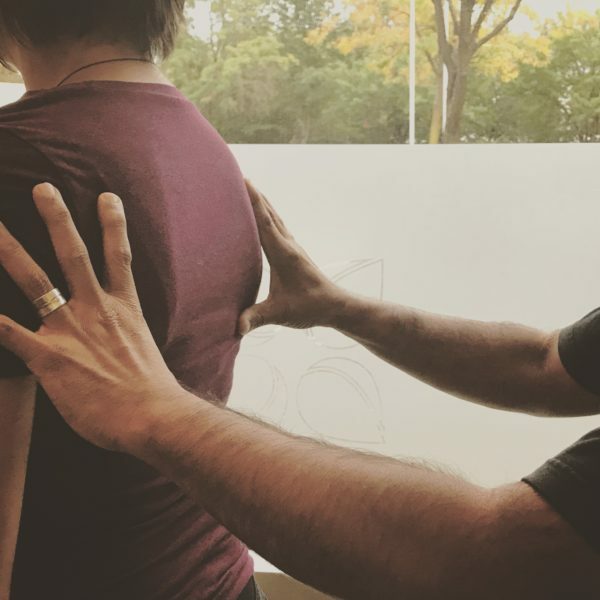 Treatments include cervical (neck) adjustments and manual therapy not only on the levators, but the trapezius, splenii muscles, sternocleidomastoid and scalenes, all important muscles that work together to ensure proper function of our head, neck and shoulders. Make an appointment with one of our providers to get an examination and treatment plan underway!